February 2016 - OMG Love Beauty! Gorgeous Vintage Nail Art Designs! Nail designs influenced by the styles of the 50's, the 60's and the 70's! NAIL TREND ALERT! Fuzzy and Furry Nails!!! This trend is a bit weird, especially the furry nails, but girls all over the world are trying it! Sometimes, being with your best friend is all the ...therapy you need! A nice collection of beautiful hairstyles for all tastes! Galaxy Nails from Outer Space! Amazing Hair Tattoos for Girls!!! Hot & Trendy suggestions for Extreme Girls! Social Networking Nails to Like and Share!!! Social media are well into our lives! Some girls even design their nails with Facebook, Instagram, Youtube colors and logos! Beautiful Photos for Valentine's Day! 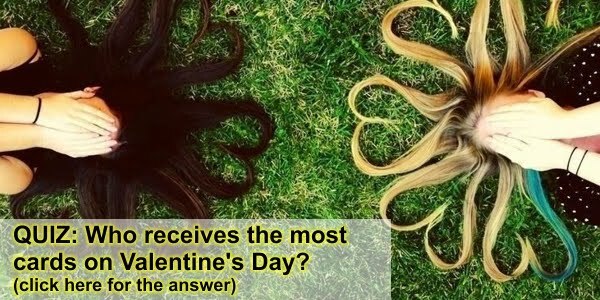 Who Receives the Most Cards on Valentine's Day??? Makeup Ideas for Valentines Day! Awesome Suggestions for your Valentine Makeup!!! Beautiful Earrings to celebrate Valentine's Day! Henna Hearts Tattoos! A great idea for Valentine's Day! Adorable Henna Tattoos with Beautiful Hearts! Great DIY Ideas for Valentines Day Gifts! Super Bowl 2016: Panthers Nails VS. Broncos Nails!!! Sweet Cupcakes & Cookies for Hair Salons!!! Impressive Tattoo Ideas for Hair Artists!!! Hairstylists are unique artists that can turn our hair into works of art! Some of them show their love the their art with a gorgeous tattoo!